Irani took a jibe at Gandhi saying that no one has got the kind of support Rahul has received by tying the 'Mahagathbandhan'. Neither Mayawati nor Akhilesh or Mamata has extended support to the Congress chief yet he is dreaming. However, no one has stopped him from dreaming though, she said. New Delhi: Congress president Rahul Gandhi and Union Minister Smriti Irani are all set to lock horns yet again in the political hotbed on Friday – almost five years after the 2014 Lok Sabha polls. Ahead of both the minister’s visit, Amethi has been decked up with posters inviting the two political leaders. Speaking of posters, several of them were seen lauding the Congress president and one of them projected him as the suited candidate for the Prime Ministerial post. Irani took a jibe at Gandhi saying that no one has got the kind of support Rahul has received by tying the ‘Mahagathbandhan’. Neither Mayawati nor Akhilesh or Mamata has extended support to the Congress chief yet he is dreaming. However, no one has stopped him from dreaming though, she said. 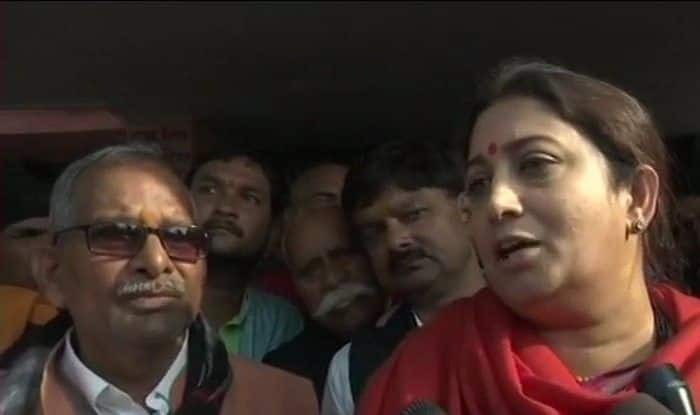 While Irani has already arrived in Amethi and started pitching for the upcoming Lok Sabha elections, Gandhi is expected to arrive in Amethi in the evening after attending Parliament session where Rafale deal continues to dominate the proceedings in the Lok Sabha. By the time Gandhi arrives in Amethi, Irani is likely to be on her way to Lucknow. While in the city, Irani blamed the Congress for creating problems in the judicial process in the Ram temple case through its lawyers and said ‘Ram Bhakts’ should ask the party about it. “Congress should not do politics through its lawyers on Ram temple issue, which is a matter of faith of people. It’s leaders, as lawyers are creating hurdles in the court. People and Ram bhakts should ask the party whether its leader wore ‘janeu’ only for polls of three states,” she said. The Congress president is the sitting MP from Amethi. Irani contested from this seat against Gandhi in 2014. Irani has been visiting Amethi regularly since 2014 Lok Sabha election. The BJP is likely to field her from Amethi in the next parliamentary polls as well. This is the first time since 2014 Lok Sabha polls that Irani and Gandhi are in Amethi the same day. During his visit to Amethi, Gandhi is scheduled to attend several public meetings today and tomorrow morning. Gandhi will take part in the oath-taking ceremony of the Gauriganj Zila Adhivakta Sangh and also inaugurate the Adhivakta Bhawan, which was built out of the MPLAD funds.